Springbank was established in 1828 on the site of Archibald Mitchell’s illicit still. The distillery is now in the hands of their current Chairman, Hedley G. Wright, Mitchell’s great, great grandson – the fifth generation of the Mitchell family to own and manage Springbank.Being based in Campbeltown, the once proclaimed ‘whisky capital of the world’, it is no surprise that many of the methods established by their forefathers are still applied in the distillery today. Passion and skill are poured into every last drop during production; ensuring whisky drinkers consistently enjoy the tastes and characteristics that have become synonymous with Springbank, Hazelburn and Longrow, the three distinct single malts made at our distillery. Springbank are incredibly proud of the whisky, the area and the history, they are dedicated to preserving the heritage of the distillery so that Springbank can continue to be enjoyed across the world for centuries to come. 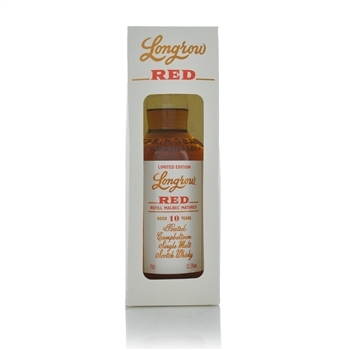 Longrow Peated offers those who enjoy a heavily peated whisky the chance to enjoy a lingering smoky taste that travels through the senses like the smoke billows from a kiln. Very creamy, vanilla custard. The smoke develops and toasted marshmallows, herbs and rich fruits appear over time. Incredibly well balanced – rich and creamy with a slight medicinal hint. The smoke is always present and washes over the palate in waves. The gentle smoke lingers and lingers. Here is what the distillery had to say about their whisky. Dark and slightly mysterious, our 18-year-old Longrow has a complex nose that unearths a peaty aroma reminiscent of dunnage warehouses.